What goes into good summer entertaining? I am going to take a page from my friend’s book to answer that question. 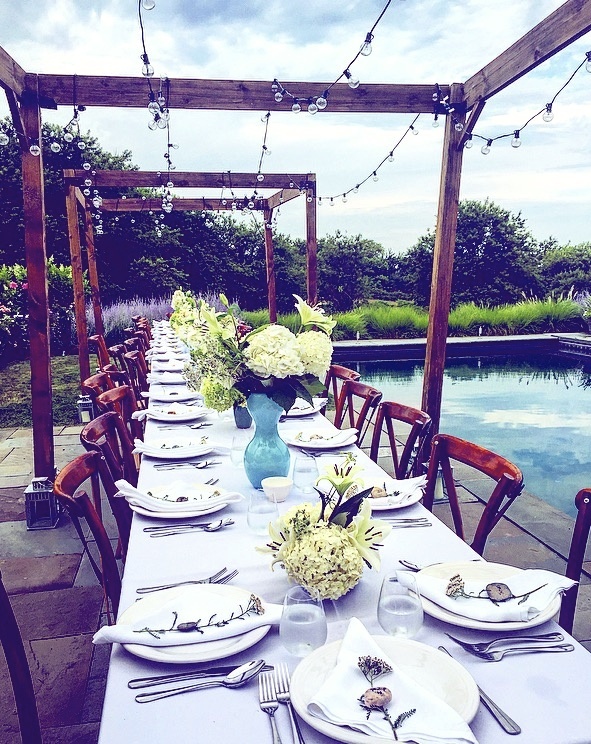 She effortlessly hosted an al fresco evening in her backyard for 35 people last month. Outdoor gardens are the perfect decor. One long table kept the seating easy. Color scheme? Keep it simple. Everything white, with hints of blue and turquoise. Beach rocks were place cards, flowers were from the garden. One glass style was used for water and wine. Hire your children! Emily and Mae set the table. More of our kids put to work. Bartending, serving and clearing. Great job ladies! Little white lights hanging over the table were simple and provided just enough light for dinner. Wry Home candles lined the table. The color scheme fit in and they didn’t blow out in the breeze! Three delicious coconut cakes for dessert. The evening was a celebration for two friends getting married. The food was farm fresh and delicious, served family style at the table. A lovely toast to the happy couple. After dessert, there were more toasts and dancing. Summer entertaining at its best!